We’d love your help. Let us know what’s wrong with this preview of Keeping Place by Jen Pollock Michel. To be human is to long for home. Home is our most fundamental human longing. And for many of us homesickness is a nagging place of grief. This book connects that desire and disappointment with the story of the Bible, helping us to see that there is a homemaking God with wide arms of welcome―and a church commissioned with this same work. "Many of us seem to be recovering th To be human is to long for home. Home is our most fundamental human longing. And for many of us homesickness is a nagging place of grief. This book connects that desire and disappointment with the story of the Bible, helping us to see that there is a homemaking God with wide arms of welcome―and a church commissioned with this same work. To ask other readers questions about Keeping Place, please sign up. The Inklings were, one and all, guilty of the heresy of the Happy Ending. They rejected the modernist aesthetic of dissonance and estrangement, and instead longed to reclaim a world of beauty and goodness-a world of enchantment. In their stories of hobbits and orcs, fauns and beavers and Father Christmas, Tolkien and Lewis told the story of home as the Scriptures tell it: the world has fallen from its original perfection, but it will one day be restored. The enduring legacy of these stories test The Inklings were, one and all, guilty of the heresy of the Happy Ending. They rejected the modernist aesthetic of dissonance and estrangement, and instead longed to reclaim a world of beauty and goodness-a world of enchantment. In their stories of hobbits and orcs, fauns and beavers and Father Christmas, Tolkien and Lewis told the story of home as the Scriptures tell it: the world has fallen from its original perfection, but it will one day be restored. The enduring legacy of these stories testify to the resonance of their hope. Humans long for the thaw of winter and the return of the King. They want to go home. Do you long for home? A place of peace, acceptance, purpose and calling. Jen Pollock Michel speaks in a narration that is profoundly poetic on what home really is and how we long for it. It made me think of my own short comings and disappointments that all point to my longing of home and how I fall short of being home. I have come to find out that I need a better understanding of what home is. With that understanding, I can focus on what is important and leave behind what hinders me. The text is done in two parts. The welcome of home - speaks to our longing, the history , the maker of home, moving from home to home, and the imperishable home. The 2nd part refers to the work of home that speaks to our labor of home done in love, the church, the marriage and how we continually say I do., feasting together, a place of rest and how we finally make it "home". Each of these expresses the gospel in sound ways that you are living the gospel out. Some of the quotes that I found encouraging that speaks of home. Are we engaged in efforts that are relevant to the groans of creation and the cries of the poor? Are we producing disciples whose work is contributing to profound transformation that set people dancing in the streets. Have we joined King Jesus on his grand, sweeping mission of restoration. These are the questions for the church related to housekeeping. They remind us that we make a home for the wandering lost in our cities not simply by throwing open our church doors but by identifying and attending to their most desperate need. Marriage isn't everything. It isn't our home or final hope. Nevertheless, it is worth the routine work of "I do". After all, marriage is its own kind of stability. This study is upside down when it comes to our culture as it should be. It is community minded, not individualized. We were created to not be alone but to be home. One of the AHA moments for me was the discussion of the Sabbath. God created Sabbath for our good to meet our spiritual needs and our physical needs. Sabbath is shown in creation as well. Without the rest of land, we have the danger of creating what happened in the 1930's. The land requires rest just as we do. But the aha moment for me was Sabbath reflects the character of God and his goodness. When I truly practice the Sabbath, I truly experience the presence of God. Another insightful was the work of keeping house. We need housekeeping and we need to embrace it for our good. The stats that Jen shared are staggering and it made me think that any depression that I may suffer is my lack of good housekeeping. Housekeeping is not just a woman's job but as a family unit, housekeeping is living out the gospel. Jen also shares insightful bible study as she goes through each chapter along with her own personal journey of home. I highly recommend this book for both men and women in their desire to come home. What a gem! I thought this book would be about the dignity and love that is inherent in the less-than-glamorous work of making a home, but it is about so much more. It is about the gospel -- God as our homemaker, home-bringer, and homecoming. The broken home that God rescues us from and the final restoration of home we look forward to. Michel's exegesis blew me away! I may not agree with everything Jen writes (or believes) theologically, but she's an outstanding writer. This story of home is well researched, well told and well worth any (Christian) reader's time. One of the best Christian books I've read in a long time. Michel follows the themes of home, homesickness, exile, rest, and keeping house through the Bible. It's profound, but immediate and familiar. She interweaves illustrations from her childhood and current life that help the reader understand where the ideas matter. Readable, practical, thoughtful. I'll refer to it over and over. It also has discussion questions in the back and would make a wonderful book for discussion. I found this book on The Englewood Review's "Advent Calendar 2017--Best Books of 2017!" Since the book seemed to be about the theology of home and the family and I am a new parent, I thought I should read it. I was delighted to find an audiobook on my library's Hoopla app. I ended up listening to much of the book while feeding my daughter her bottle! Keeping Place is a bit of spiritual memoir, cultural critique, biblical studies, theology, and spirituality. Michel explains how Scripture begins wi I found this book on The Englewood Review's "Advent Calendar 2017--Best Books of 2017!" Since the book seemed to be about the theology of home and the family and I am a new parent, I thought I should read it. I was delighted to find an audiobook on my library's Hoopla app. I ended up listening to much of the book while feeding my daughter her bottle! 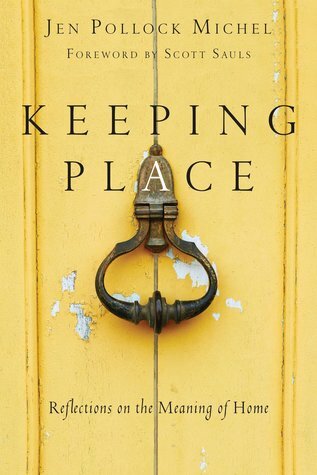 Keeping Place is a bit of spiritual memoir, cultural critique, biblical studies, theology, and spirituality. Michel explains how Scripture begins with God making a home with humans and ends with God making a home with humans. God is the God of housekeeping. Other topics include parenting, marriage, the family, hospitality, belonging, and Sabbath-keeping. Michel weaves together all of these themes with references to C.S. Lewis, Abraham Joshua Heschel, Walter Brueggemann, Robert Alter, James K.A. Smith, and Andy Crouch. Keeping Place is an important book on the topic of home. Author Jen Pollock Michel writes about our longing for a place to belong. She weaves a history of home and the meaning of place through the stories of Scripture. The second half of the book covers the work of home. Pollock bemoans the fact that "housework' and 'homemaking' are not always valued. She writes, "Housekeeping, as worship and work, rightly relates us to God as well as to our fellow humans." Keeping place is an important way to le Keeping Place is an important book on the topic of home. Author Jen Pollock Michel writes about our longing for a place to belong. She weaves a history of home and the meaning of place through the stories of Scripture. The second half of the book covers the work of home. Pollock bemoans the fact that "housework' and 'homemaking' are not always valued. She writes, "Housekeeping, as worship and work, rightly relates us to God as well as to our fellow humans." Keeping place is an important way to let the people in our lives know that they matter. One of the best non-fiction "Christian living" books I've read in a while. I very much enjoyed the blend of memoir and Scripture analysis/reflection. I found this book refreshing in its examination of God as homemaker, the One who makes a home for his people. I listened to the audiobook, which is read very well by the author herself. Highly recommended. Jen Michel is a superb writer. Her word pictures make her stories come alive. The realities of homesickness and homelessness are heart truths. And the beauty of our true and lasting home beckons. Jen Pollock Michel's beautiful, thoughtful, new book is rich with profound but accessible ideas about the physical, relational, and spiritual homes we make. In Keeping Place we begin to understand why we long for home so deeply. Not just the houses we grew up in, the people with grew up with, but far deeper and wider, into nostalgia, grief, women's rights, church, marriage, sabbath rest, and heaven. I have many ideas scribbled in the margins of my copy of Keeping Place. I need to spend much more t Jen Pollock Michel's beautiful, thoughtful, new book is rich with profound but accessible ideas about the physical, relational, and spiritual homes we make. 1. What roots have I dug up and transplanted at my 11 different addresses? What have I left behind? What have I lost? What can be found again to make my current Home thrive? 2. Can Home be more than one place? - Will my kids say they are from Georgia when they go to college? Or will they always say they're from Wheaton, Illinois? Have I finished grieving my (almost 2 years ago) move away? 3. Can I honestly say the Lord is my Home? That all my stuff, my identity, my love, and my service all fits into and under my relationship with the God who loves me? 4. How can I make Homemaking more worshipful as a creative, steadfast, and welcoming woman with generous service and firm boundaries? What new things can I try? What old things could I stop? I enjoyed quietly reading Keeping Place by myself, carefully answering the study questions in the back, and praying through the tough answers. It also would be great for small groups, with or without the DVD. As James K. A. Smith describes, we are "'narrative animals': we define who we are, and what we ought to do, on the basis of what story we see ourselves in" Home is that story. This last statement reveals the deeper subterranean ambitions of this book, what it really wants to be despite it's fairly modest statement that it is merely a series of "reflections." It is a statement that the "home" is what the Christian life is about, that "HOME" write large is the Christian story. This is a large, I would say grandiose, claim, and the book suffers for it. On the one hand, in terms of the book's composition, it is an overextended metaphor leading the author to make claims about the centrality of home in biblical narrative and ecclesiastical life that are finally strained beyond the breaking point of belief. Moreover there is all too little critical force attached to these reflections to make the kind of theological claim that she really wants to make plausible. There is all too little mention of all the ways that the biblical narrative disrupts and unsettles the idea of home and home making. The Son of Man has no place to lay his head, as he admonishes his followers to remember. If we take the words of Jesus seriously that all those gathered around him, at times by the hundreds or thousands, are his mother, brothers, and sisters, this makes the boundaries of home so permeable as to be dispersed into the solution of humanity in a way that the metaphor of home strains to accommodate. The people of Israel most often stumbled when they preferred the comforts of home to the arduousness of obedience. In the end the book is the apotheosis of home, but I find myself suspicious of every human metaphor made into a divine thing. I do not mean to imply by this statement or my mood, that the author or her more sympathetic readers are somehow in sympathy with the evils that have been wrought by white supremacy or by misogyny. Indeed, one of the best things about the book is the ways that it dignifies what is often, almost always, taken to be "women's work" in the making of home. I appreciated Michel's note that this was a fairly recent phenomenon in many ways, the responsibility of men for life at home being a theme to be found in earlier eras of human culture. (Even if, I would hasten to add, those cultures were usually no better at exhibiting the mutuality that Michel seems to long for, but never fully articulates). The book is earnest; there are scores of anecdotes and tidbits of practical advice that will help those that struggle with the difficulties of home life, and it will remind those who can hear it that all acts, great and small, are or can be acts of holiness that sanctify the world. Perhaps more importantly they are acts that aid us in the pursuit of holiness ourselves. If you like a book that is relatable but also meaty, one that will challenge as well as encourage you, I highly recommend this read. Michel brings together so many different voices into this dialogue and together they come to an understanding both our longing for home and how to be instruments in creating it. She includes psychological, theological, and literary perspectives and her own well-thought-through exegesis of the theme of "home" throughout scripture. I wish I could have a dialogue with If you like a book that is relatable but also meaty, one that will challenge as well as encourage you, I highly recommend this read. Michel brings together so many different voices into this dialogue and together they come to an understanding both our longing for home and how to be instruments in creating it. She includes psychological, theological, and literary perspectives and her own well-thought-through exegesis of the theme of "home" throughout scripture. I wish I could have a dialogue with Michel because though I don't always agree with her perspective (or at least the emphasis of it), she points the discussion right where it matters. I would recommend this to any follower of Christ in any season--Michel's idea of home goes deeper than the lines between married or single, home-body or traveler. I will be sending this along to bless other people in my life. It's the kind of book that needs to be shared and bonds people together. You are invited to TheWillowNook.com for a full review. Rootedness was always the thing that both repelled and intrigued me. I left my parents’ home at the age of seventeen and pictured a life unleashed — no commitments. I copied all my record albums onto small and portable cassette tapes (dinosaur alert!) and prepared for the unencumbered life. With that resolve in my rear view mirror, no one is more surprised than I am to have lived (happily) at the same address for 23 years, making a home and being re-made by the challenges and joys of home. In Keeping Place, Jen Pollock Michel examines her own history of home and the continual need to cherish change which her life circumstances have fostered. She ponders the beauty of place, emphasizing that Scripture is “a home story” and that the truth of the gospel is best understood in terms of our yearning to belong, our struggle with homesickness, and the ache of all our longings. Church leaders, then, become the managers of God’s household. Both male and female parents are given a role in the hard work of child rearing. Routine chores become an offering and a valued means to the greater end of fostering a sense of security and belonging. God’s work in creation and in redemption is clearly housekeeping. He finds lost things, He prepares tables of abundance and blessing in hard places, He kills the fatted calf and invites the neighborhood to a party. Therefore, engineering the comforts of home, taking on the mess in the bottom of the refrigerator, performing the domestic routines that preserve order and hold chaos at bay create a feeling of home wherever they are performed with love, and they pre-figure God in His role as Homemaker. Homemaking is a work of welcoming and provision. “Stability” is a term that occurs early and often in Keeping Place. Presenting as a spiritual discipline and as an opposite to rootlessness, it signifies a commitment to make a difference in a specific place and time. The paradox of the Christian life is this need for full investment, wherever we are, whatever our calling — in stark contrast to the need to also hold it all loosely. To be mortal is to be plagued by the impermanence of all that we hold dear. The truth of resurrection, expressed in the language of Home, is that all the perished things will one day be restored, our need for belonging will be fulfilled at long last, and, in the meantime, the Word of God speaks truth into all of our longings and our losses, into all of our dreams of Home. I didn't love this book, but it has some solid material. I appreciated that it wasn't a Wendell Berry-esque adulation of place and rootedness--it comes, rather, from an author who's mostly lacked those things in her life, which gives some weight and texture to her reflections. It *is*, as the title suggests, more of a set of meditations on home and housekeeping than an argument or sustained exploration of a concept. Michel looks at some of our contemporary ambivalences about "home," at God as "h I didn't love this book, but it has some solid material. I appreciated that it wasn't a Wendell Berry-esque adulation of place and rootedness--it comes, rather, from an author who's mostly lacked those things in her life, which gives some weight and texture to her reflections. It *is*, as the title suggests, more of a set of meditations on home and housekeeping than an argument or sustained exploration of a concept. Michel looks at some of our contemporary ambivalences about "home," at God as "housekeeper" throughout scripture, at our "housekeeping" in this life as we wait and work toward the stable, eternal home only God can provide. She does this through personal narrative, discussion of recent research and journalistic thinkpieces, references to literature, and biblical scholarship. Her writing style isn't my favorite--a touch too clever for my taste? I'm not sure--and her use of the phrase "the housekeeping" in the second half of the book was a bit distracting. I also thought she gave short shrift to the Puritan view of Sabbath-keeping. Overall, it has that serial feel that a lot of thematic, semi-autobiographical works of this kind tend to have--as if it might have worked a bit better as a blog series than as a book. But I appreciate her constant emphasis on Christ as the answer to our longings for home, in a way that will be tangibly satisfied someday, even if we only get a taste of it in this life. "Our inbetween places--between jobs, between cities, between houses--can easily feel like a bookmark, as if their only job was separating past from future. But these places are indeed part of the story, even when we have failed to give them a name. And most peculiarly, a generic, in-between place can even become a temple in the desert--a house of God." "God's work is not nearly as glamorous as our self-glorifying ambitions." "Home, on this earth, is no perfect place, and one of our greatest acts of faithful courage might be abiding the weariness of imperfect company, both that of ourselves and others." 4.5 stars LOVED this book! For me, this was definitely a case of the right book at the right time, it was so timely that in several places it cause me to catch my breath. Finally, a book about "home" from a Christian perspective that delves into the topic using the bible as a whole and not just isolated, taken out of context "women in the home" verses. Such a breath of fresh air and so deeply thoughtful and challenging. I finished the last page and immediately opened the first page of another bo 4.5 stars LOVED this book! For me, this was definitely a case of the right book at the right time, it was so timely that in several places it cause me to catch my breath. Finally, a book about "home" from a Christian perspective that delves into the topic using the bible as a whole and not just isolated, taken out of context "women in the home" verses. Such a breath of fresh air and so deeply thoughtful and challenging. I finished the last page and immediately opened the first page of another book from her. Christian women need more writers like Jen Pollock Michel - biblical, full of grace, challenging and not condescending. This is so much more than a book about home, which is why I think "Keeping PLACE" is such an appropriate title. I am planning to use the book as a study for our women's group. (Also, as an aside, this is a book I would happily pass on to a male reader, as I believe it would challenge their perspective on home too!). "God offered us stability in the only thing that cannot fail - God's faithfulness itself. Under a moonless sky, a placeless man gains hope, a nameless place, a name. The place becomes Bethel, the "house of God." Bethel reveals that God is present in every liminal place, lending his anchoring weight to our weightless lives. Our in-between places - between jobs, between cities, between houses - can easily feel like a bookmark, as if their only job was separating past from future. But these places are indeed part of the story, even when we have failed to give them a name. And most peculiarly, a generic, in-between place can even become a temple in the desert - a house of God. A nameless place can be the site of tentatively taking our first step toward trust; it's at Bethel that we can begin believing in a God who journeys with us." Jen Pollock Michel’s ponderings on home provide the perfect setting to reflect on the Kingdom of God. She creates beautiful word pictures to bring intangibles into focus. Weaving personal stories of loss as well as joy with biblical illustrations, she eased me into the deep waters of the theological pool. Jen Pollock Michel’s writing caused me to pause after each chapter. The truths needed time to soak into my brain and then into my soul. While we wait for our true home in heaven, we have homes Jen Pollock Michel’s ponderings on home provide the perfect setting to reflect on the Kingdom of God. She creates beautiful word pictures to bring intangibles into focus. Weaving personal stories of loss as well as joy with biblical illustrations, she eased me into the deep waters of the theological pool. Jen Pollock Michel’s writing caused me to pause after each chapter. The truths needed time to soak into my brain and then into my soul. While we wait for our true home in heaven, we have homes and housekeeping needing our attention. “God’s work is not nearly as glamorous as our self-glorifying ambitions…(yet) Housekeeping is home’s daily chore of faith, hope, and love” (p. 197). Keeping Place is biblically-based and well-researched. The plethora of book references to historians, scholars, essayists, and novelists provide numerous places to puruse additional reading. 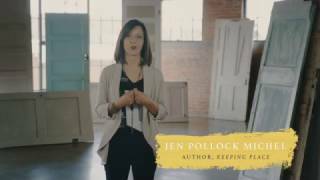 I highly recommend Jen Pollock Michel’s second book, Keeping Place! You know when you finish reading a book and then immediately realize you should read it again? This is that kind of book! As a person who lived abroad for a decade and still struggles with finding a sense of "home", Jen Michel's book really hit a nerve. In a good way. Beautifully written with solid theological references, and inspiring thoughts-- this book did a great job of showing how home is a place we all long for and how we can create such spaces. I am not a homemaker, or a wife or a mother, You know when you finish reading a book and then immediately realize you should read it again? This is that kind of book! I am not a homemaker, or a wife or a mother, yet found there were so many things I could relate to and take away with me. Jen Pollock Michel is an incredibly gifted writer. Her theology continues to be somewhat right of my own mainline tradition, but her work inspires, instructs, and challenges me in so many ways. Lots to treasure in this book. She's particularly skilled at weaving her own reflections in with varied voices from literature and theology. Best chapter was on the "unyielding obligations of love's housekeeping." "It is a logical impossibility to love my children and refuse to provide them lunch. To love Jen Pollock Michel is an incredibly gifted writer. Her theology continues to be somewhat right of my own mainline tradition, but her work inspires, instructs, and challenges me in so many ways. Lots to treasure in this book. She's particularly skilled at weaving her own reflections in with varied voices from literature and theology. Best chapter was on the "unyielding obligations of love's housekeeping." "It is a logical impossibility to love my children and refuse to provide them lunch. To love is to labor." This is a book rich in memory and theology, a cohesive reflection about the welcome of home: the longing we have for homes we’ve left, the ones our parents made and those we established for ourselves and our families. Whether we stay put or move, we realize that homes on earth are perishable. Keeping Place is also about work: routines and rhythms, burdens and benefits of home in our families, churches, and neighborhoods. A delightful read, which includes a wide range of references. With our recent cross country move, I thought this book seemed appropriate. What is the meaning of home? This book had some beautiful language and some great theological ideas. Nothing earth shattering, but good reminders. However, it lacked any kind of practical application. A pleasant read, but not much more. I waited for this story… the one where I’m reminded yet again of all the homes that are part of my story, my true homeplace and the one I heard about the glory of housekeeping, of making home and belonging to it, most of all the One who keeps a home for me. Read this one slowly, really slowly, and savor the beauty of all home can and will be. Very intriguing. Michel has such a beautiful way with words -- and I fell in love with her writing and speaking style when I read/studied Teach Us to Want. Bonus! I love that we share Columbus, Ohio as a home and I felt both nostalgia and connection when she shared stories from there. I did get a little distracted listening, though, as there is a lot on my mind these days. Jen Michel is a great writer and thinker. Too much quoting from other sources, and she seems to lose her way a little in the middle, but those are minor quibbles about a heartfelt and insightful sophomore offering. I started this one in 2017, but finished it in 2018. It is a slow read in that, at least for me, I needed to stop and reflect on the content pretty frequently. There was much to think about. This book helped me better understand my role as “housekeeper” in my home, my church, and God’s kingdom. I wish it had been available when I was much younger, but I am grateful for its impact now. A wonderful book about home, life, love, travel, and The Bible. Awesome storytelling, kind advice. One I will re-visit often! I've written three books: Surprised by Paradox, Keeping Place, and Teach Us to Want. I've also contributed chapters to essay collections like Our Secular Age, Identity Theft, The Wonder Years, and Everbloom. Besides books, I write widely for digital and print publications and also travel to speak at churches, conferences, and retreats. Back in the day, I earned my BA in French from Wheaton College and my MA in literature from Northwestern University.